For honeymoon knitting I wanted a very simple garter stitch shawl, something I couldn’t possibly mess up. 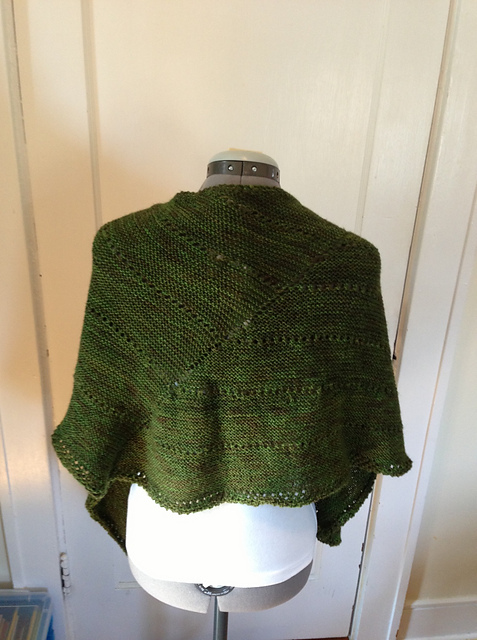 Veera Välimäki is the reigning queen of such shawls, at least in the Kingdom of Ravelry. I chose one of her many asymmetrical designs: Line Break. Nothing too hard. Just short rows and eyelets. 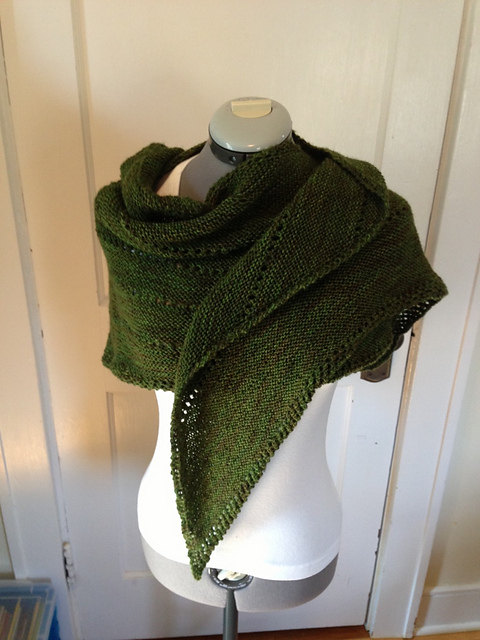 Shawl pattern, meet scenic coastal highway. Somewhere along the line, a few of my stitch markers slipped under yarn-overs. And I never noticed. Never cared. I was too busy looking at the beaches, the sea lions, the tossing waves, the precariously perched sea-side homes. When I got home and took a good look at the shawl I saw my mistakes. The misplaced eyelets are beyond obvious in a design like this. I thought about ripping the whole thing out and starting over, but the idea seemed like sacrilege. I have precious memories of our drive down Hwy 101 and they’re bound up in this shawl. I look at those misplaced eyelets and I don’t really see mistakes. I see a foggy morning in Newport. I see my husband saying something so funny I dropped a stitch. I see the roadside yarn shop–the one HE spotted and pulled over for while I was busy looking at a map. Those misplaced eyelets are the best part of the entire shawl. I can’t even bring myself to block this thing. I don’t want to do anything to change its shape. I don’t blame you – the whole story makes me feel nice and tingly all over. Congratulations by the way and may you have very many wonderful memories stored in the stray eyelets over the years. What a lovely thing to have for the memories as well as a very pretty shawl. I love your scarf, the memories, the COLOR and the fact that your husband pulled over for a yarn store. no reason to fix or even to block – it’s beautiful the way it is. Awww. I’ve heard people talk about old tattoos that way. Sometimes it really is just about the experience. I think it looks lovely, and I rarely block any of my pieces, if you’re happy with the shape you don’t need to! I believe the word you’re looking for is “design feature”. I love those pieces of knitting which remind you of where you were knitting it. It looks perfect and it comes with a story! Clearly, you married the right man if he spotted a yarn shop and pulled over all on his own. Keep him and the shawl just the way they are. I find that memories become bound up in projects. So when I pick up a piece of knitting, I remember how I knitted it, when I knitted it, what I talked about at the time… you said it all above. You cannot possibly rip it out. It will be like unravelling all those wonderful, precious memories you have stored into it. It is gorgeous, and I can’t even see the ‘mistakes’ you mention. May you have many more happy memories wearing your precious shawl. Don’t change it! It’s lovely!! Although I am a self-admitted fussy perfectionist, even I second what everyone else has said: This shawl is a KEEPER the way it is — just like your husband!